OXFORD, Miss. 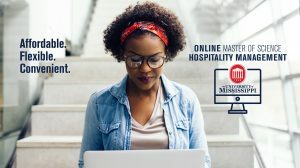 – The University of Mississippi is rolling out a new online Master of Science degree in hospitality management to help meet the needs of a growing industry. The program is designed for people working in the industry in management roles to develop more effective operational and analytical skills, talents needed for top-level jobs in a global hospitality marketplace. With the hospitality industry’s projected growth at 6 percent in lodging, 11 percent in meetings, conventions and events, and 9 percent in food service from 2016 to 2026, according to the Bureau of Labor Statistics Occupational Outlook Handbook, businesses are looking for tomorrow’s leaders. From hotels and travel companies to restaurant groups and tourism, the need for executive-level professionals who have skills to oversee complex operations is increasing. Joey Vasilyev, a 2003 graduate from the hospitality management program, understands the demands of the industry and sees great value in offering this advanced course of study in an online format. Work schedules of the hospitality workforce are wide-ranging and unique, said Vasilyev, CEO of V2 Inc., a franchisee of Taco Bell. “The online program will offer a solution to hospitality management individuals who seek an alternative method of educational advancement in the industry,” Vasilyev said. “It is very exciting to see the program continue to grow and evolve since my time as the first freshman to enroll in hospitality management. Advanced food-service, lodging and service quality management classes coupled with advanced marketing, leadership and research course work are at the core of the curriculum. Faculty members tout expertise in sustainability practices, menu analysis, social media marketing, service quality management, consumer behavior, nutrition, human resources and financial analysis, so graduate students will have mentorship and support across a wide array of research interests. Research is an important part of the program, and students will learn the methods and statistics needed to conduct meaningful studies for their organizations. Students will conduct professional research or complete a thesis on an industry topic important to them or their employer. The average cost of a master’s degree is between $30,000 and $120,000, according to FinAid.org. Tuition for the online M.S. in hospitality management costs $16,740 for a 36-hour program that students complete over the course of two academic years. “Yes, this degree is one of the most affordable you will find of its kind, but beyond that, it is flexible,” Roseman said. “We’ve designed this program specifically for working people in an incredibly busy industry to log in according to their schedule. Online graduate programs at Ole Miss are already garnering national attention for graduating exceptional professionals with advanced degrees. With the online MBA ranked No. 20 and the School of Education’s online graduate programs tied for No. 35 in the nation this year, according to U.S. News and World Report, UM is gaining a solid reputation for providing quality graduate-level programs in an online setting. The application deadline for those interested in beginning the program in August is July 15. For information about the program, the application or any other details, visit http://nhm.olemiss.edu/onlinemshm or call 662-915-1505.